UPDATED: Mon., June 26, 2017, 7:34 p.m.
It’s easy to see why property developers are taking an interest in shaping the way people see downtown Spokane’s skyline. Not necessarily by one-upping each other with taller spires of concrete, but instead by offering tenants, residents and the public a view that can only be found at the highest point: the rooftop. It’s no wonder then that as hundreds of millions of dollars of investment pours into downtown and neighboring areas, one of the check-boxes on some people’s lists is increasingly becoming rooftop access. Here’s a look at a few of the rooftops peppering downtown Spokane, some popular, some unknown. The Saranac Building on Main Avenue could easily boast itself as Spokane’s “greenest building.”Certified with the highest ranking by the U.S. Green Building Council, it has a rooftop garden and large solar panel arrays. The building looks like it belongs in the heart of Seattle. But it’s in one of Spokane’s blossoming food and bar corridors, and its rooftop matches the style. The building, which shares spaces with the Community Building, has multiple rooftop spaces available for tenants, featuring tables, chairs and even barbecues. Bazile, along with about a dozen other officer workers, stole an afternoon to enjoy the sun and fresh air from the building’s second-floor patio area. It’s not open to the public, but Austen White, the “maintenance dude” for the building, said people can rent it if they want to. White takes great pride in the work he puts into maintaining several square yards of garden space blanketing the multitiered rooftop. All of the rain that falls is captured in the basement, where it’s reused to water the plants in the drier months. 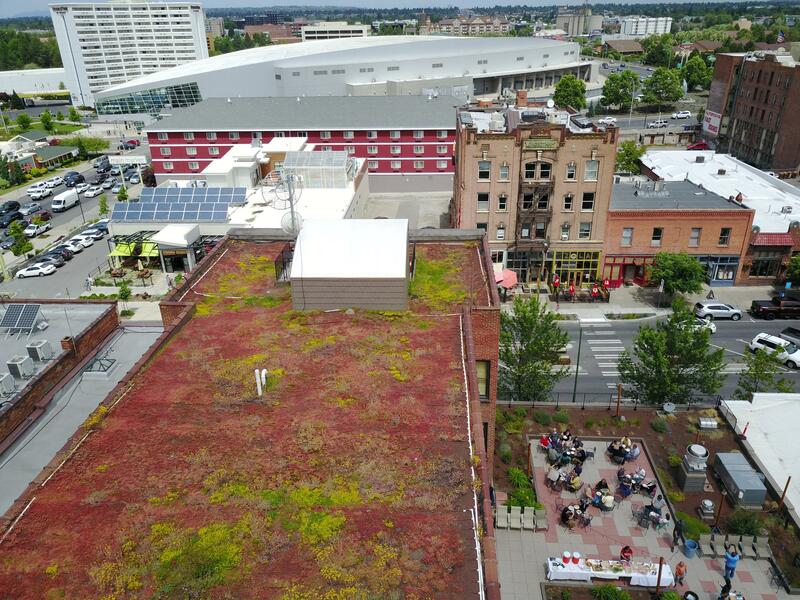 While looking out from the fifth floor, White hypothesized “green” roofs might one day become standard in Spokane. While looking out at the view of downtown Spokane from high above the Centennial Trail in Kendall Yards, property manager Heather Teston remarks how beautiful the skyline is from this angle. “You don’t get this from the freeway,” she said. Which is why she pressured her bosses at Greenstone Homes to add a space at the Highline Loft Apartments usable for all 182 of Greenstone’s apartments in the area. The rooftop space, which also can be rented by the general public, has tables for eating, and chaise lounge chairs for relaxing. There’s also a barbecue and even a bathroom so people don’t have to leave. Teston said since the building was built about four years ago the rooftop space has slowly gained in popularity. She said she hopes in the future they can add other amenities, such as a projector or TV screen for football season, or possibly a fire pit in the winter. “What’s up with the gargoyles?” is a question Yost, the director of real estate investments at Centennial Properties, hears often about the rooftop space on top of the Chronicle Building. When the Chronicle Building converted from office to residential space last year, Yost said the drainage pipes below were failing. So as they were replacing plumbing in the floors below, they decided to update the entire deck. “We’re trying to clean it up, make it more user friendly,” he said. The rooftop, which is available for all office workers in the Spokesman-Review Tower, will also be available to Chronicle residents and will feature all of the amenities residents could expect: tables, chairs and barbecues. He said he’d like to see residents using the space whenever possible, especially to meet new people. As for the story behind the gargoyles? Of all the downtown rooftops visible from Google Maps, the Banner Bank Building is perhaps the most noticeable. Not because it’s covered in plants, wood structures, or has paintings of giant spiders on it: because it has a fully-functional basketball court. “It gets used a lot,” said Alicia Barbieri, vice president of Goodale and Barbieri, which manages the property. The court is comprised of hundreds of rubber interlocking tiles laid on top of a thick shock-absorbing mat, so when a game is going on up above, those toiling away at work won’t hear the thuds. And it’s available for any of the tenants staying in the office space at 111 N. Post St.
It’s the brainchild of SRM Development, the company that oversaw the building’s remodel in 2008, Barbieri said. Barbieri said it’s not uncommon to see heated games of 1-on-1 and 3-on-3 going on after work. If they last until nightfall, there are spotlights set up around the high fencing, and even a sound system with large speakers wired throughout. The view from atop the Paulsen Center is almost too good to just be office space. In fact, for more than a year, it sat empty as property managers fielded request after request to live there – not work there. “Probably 90 percent of the calls we get are people who want to rent it as a residence,” said Scarlett Stalter, assistant property manager of the Paulsen Center, in a Spokesman-Review story from December 2015. But today, it’s occupied by Bozzi Media, the publishers of Spokane-Coeur d’Alene Living and Catalyst magazines, which moved in February 2016. Before that it was leased by Estate Strategies, which moved to the ninth floor while the building’s elevators were replaced. And before that, it was home to Helen Paulsen, the daughter-in-law of Myrtle Paulsen, widow to mining magnate August Paulsen. Helen Paulsen moved there in 1957 and occupied the space until 2007, when she died. Published: June 25, 2017, midnight Updated: June 26, 2017, 7:34 p.m.